I am Sri Lankan working professional passionate with wildlife and nature photography. Though I have a basic camera and lens (camera body: canon 70D and lenses of 18-55mm & 55-250mm) and budgeted life style, I always prefer to go wildlife photography tour as low cost as possible. With god grace I got a friend who could travel with me on same basis with lower budget of less than USD 50 per day tour to Wilpattu National Park of Sri Lanka(though 7 people could occupy in jeep we always prefer only 2 per jeep, because from any angel you can take photograph without disturbing other partner). We planned to visit Wilpattu National Park on 22nd October 2015 for one day tour (Fullday tour from 6.00 AM to 6.00 PM) so we left from colombo 21st October 2015 night 10.30 Pm to Petteh private bus stand. Once we reach the bus stand we had a plain tea with rotti to boost us and then proceeds to a small shopping of 4 soft drinks (canned drink) and biscuits (250g) for our breakfast for our next day at Willpattu National Park. By11.15 pm we were at Colombo- vavuniya bus terminal and took Colombo – vavuniya Bus (via Puttalam route) at 11.40 pm. By 2.45 AM bus stopped at madurankuli for a snack & breaks of 15 minutes and reaches Wilpattu Junction by 4.00 AM. As we discuss in advanced with our safari jeep driver, once we get down at Wilpattu Junction we called our safari tour coordinator (jeep driver) for pick up us and drop to room for a quick refresh, by 4.20Am safari driver came and pickup us and drop to room by 4.35 AM. After a quick refesh within 30 minutes we were get ready for a safari, we ask our jeep driver to come early as possible to go entrance as first visitor (commonly leopard sighting are high in early morning, so get into park early may bless us for a leopard sighting). So our jeep driver came by 5.10 AM and we reach Wilpattu National park Entrance by 5.25 AM as first visitor and 2nd visitor came by 5.35 AM. By 6.00 AM counter was open and we proceeds to our wildlife photography experience. The month of october is known as rainy month at Wilpattu National Park, therefore we really felt we may not see a leopard for a whole day, but we may see a bear; even our safari driver said same. 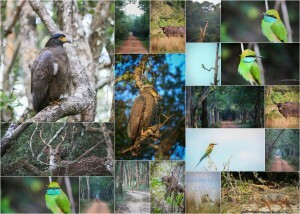 So from the time of entrance we could able to see a golden jackals, spotted deers, wildbore, peacock, bee eaters, fish eagle, serpent eagle, malabar hornbill and for the first time we show a sri lankan endemic hornbill and many more birds. 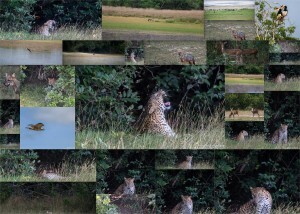 But luckily by 9.30AM our jeep driver spotted a Leopard at Talawila Villu(Lake) and this leopard sighting was lead till 12.00 Noon almost for 2.5 hours and I was filled my memory card with more than 400 photos of leopards. Than we proceeds to Kumbuka Villu for our lunch and after lunch we napped for an hour inside jeep. So this time would be good sleeping time for us and rest time for jeep driver too. Than by 1.30PM we again proceeds to thalawila for spot a leopard again but we didn’t get a chance, so we were wait sometime at mannika villu as it is nearest lack to talawila lake. But no luck, but while waiting we could see again a couple of golden Jackals, Spotted Deers, Wildbore, Peacock, Bee eaters and many birds. Due to a rainy season we left from there by 3.45 PM and reach entrance/ exit location by 5.30 PM. Just we entered to exit, a elephant was cross the road, so we were lucky to an elephant in that day too J. Than we proceed to room and had a quick refresh; than same jeep driver drop us again at Willpattu Junction for us to take bus to Colombo. by 7.30 PM we taken jaffna –colombo bus and reach Colombo pettah Bus Stand by 11.00 PM and reach home by 11.45 Pm. If you have any questions please do write below comment, I am so passionate to give my answers. Department of Examination of Sri Lanka has released G.C.E (O/L) 2015 Timetable recently; Examinations are schedule to be start from 8th December 2015 to 17th December 2015. Motor Traffic Department of Sri Lanka has made a statement stated that they received 491,628 vehicles registration for first 8 months of this year. Last year first 8 month vehicle registrations were 429,556 and it has increase by 14.45% over the year. The highest numbers of vehicles registered this year were motorbikes and three-wheelers, which are 243,165 Motor Cycle registrations and 84,592 Motor Cycle Registration. In the meantime, Finance Minister Ravi Karunanayake said made a statement that the maximum loan-to-value ratio for vehicle leasing has been increased from 70 to 90 percent from4th October 2015. Government should taken steps to improve their SLTB bus services into Normal and comfortable ultra luxury passenger bus at an affordable cost. 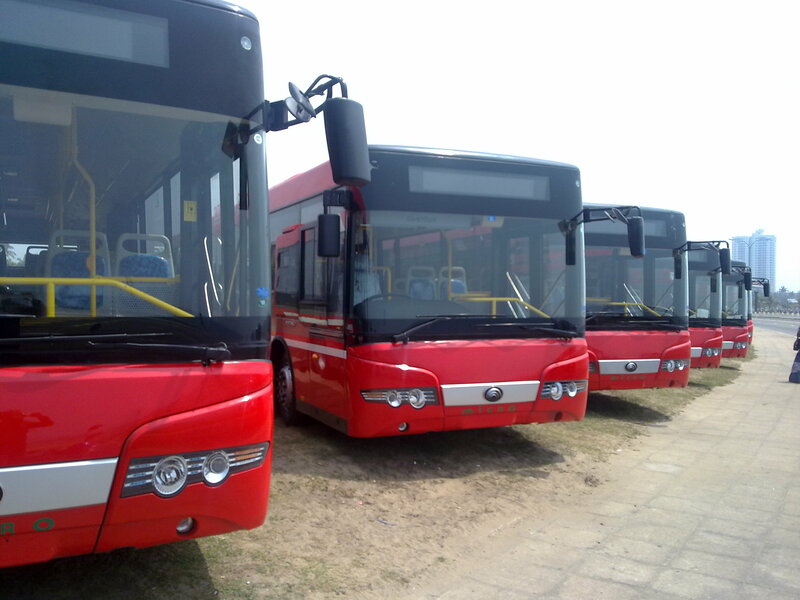 They could run their SLTB ordinary bus service at low price as usual and ultra luxury passenger bus at premium price. If the Transport ministry could taken steps to improve timely services for Buses and control the bus movement by GPS and makesure same route buses would be compete at any given time. If any bus drivers drown over speed or misbehave with passengers should be fined and taken action against to them. Government should take actions to improve Train service between main cities and urban rail service on demand. Still many of working crowed has using train transport to reach their work place on time, if government could offer frequent train services with much comforable in peak time, many people would not considered to by a vehicle on their own. there were some rummer articles state that government is planning for metro services within western provinces and it stated that the Metro is from Negombo from North to Panadura to South and Kottawa from West to hub at Fort Colombo. If that news was not rummer, this would be great help to avoid Colombo traffic and this would help to save millions of dollars as fuel and time. In overall Sri Lanka need an ultimate transport solution to avoid traffic in city, unless we may face huge problems when Srilanka reaches 2.5 Million Tourist arrival in 2020. Better Transport system will make Better Eco Friendly Sri Lanka to cater many industry in near future.